So my least favorite thing about the UPS/FedEx/USPS is that damn signature confirmation... Now I can't show you my contest pair until Monday!! Camping, riding, lumberjacking, stuck in the mud, sheetrocking, bmx'ing, hiking, snow shoeing, infant chasing, shed building, tractor rebuilding, trench digging, beach walking, snow shoveling, office working, snow shoveling, pallet moving, gate staining, 3 houses moved, bachelor partying x2, gambling, even to Miss America Pageant + a 5 Alarm Fire, trip to Brussels & Berlin. 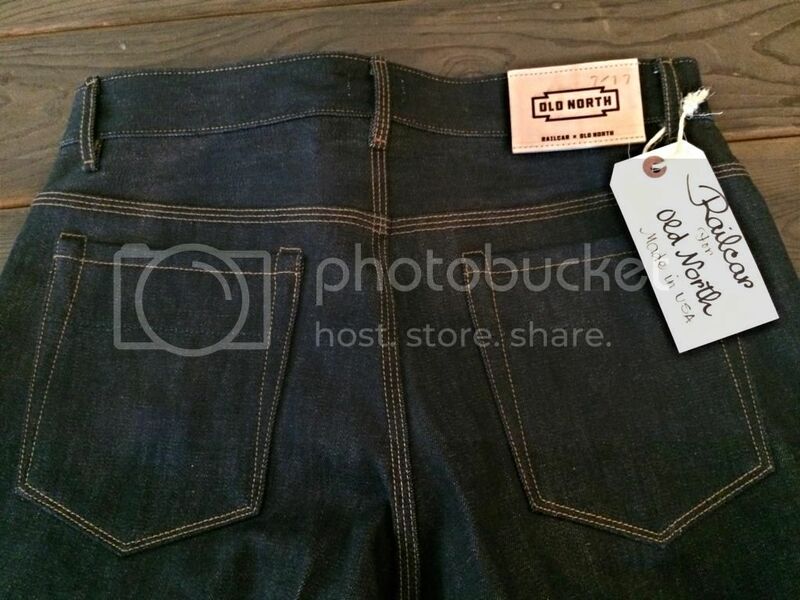 Does anyone know what color the selvedge line is on these 16oz cone Railcars? These days are more than we'd ever hoped for"
The old north x railcar is a 16.7oz orange line cone mills and the 16.25oz is red line cone mills. Aproy!!! Post pictures when you get em!!! 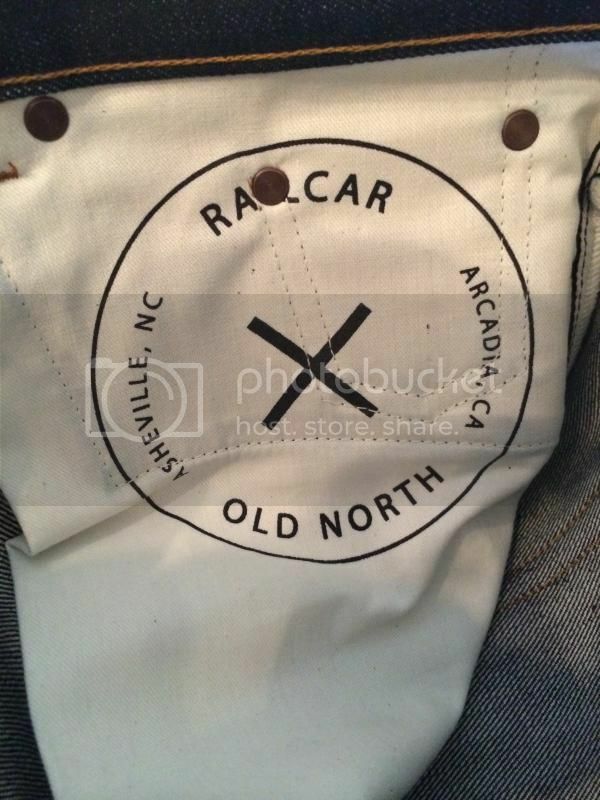 I went with the old north X railcar 16.7oz cone. Just placed the order. Those Old North ones look fantastic. The orange line is a plus. I'm a sucker for unique patches too. Yea I've only had blue or red line selvedge in the past so I wanted to go with these for something new. Plus from what I understand it's the heaviest cone selvedge to date. Mine should be on my doorstep when I get there. Did you get the old north pair??? Hey Steven, got any leftover orange line laying around to make me a pair? I'm pretty sure you can still get them at old north. first impression, I'm very impressed. the fabric is amazing, so soft to the touch, almost smooth (i have also been wearing a very slubby pair of pure blue japans for a while). the patch is beautiful! think and burned to perfection, i love the individual stamped "7/17". the thread is a different brown than other railcars, and its very rich looking. i tried them on and the fit is perfect... i think i was made for spikes. they fit so well that i contemplated wearing them to peru this week and buying another pair for this contest... but don't worry i talked myself out of it. Wow I don't know how I'm going to wait another 3 months to wear these. Beautiful. The only part I wish was different is the pocket bags. And only because the ones on the RDCX013 were made out of duck canvas.. They are so tough. I was spoiled by those pocket bags.